Hundreds of people were waiting to enter the Capitol through the Visitor’s Centre in lineups that would eventually stretch into the thousands by 8:30 PM on Monday evening. There were families with young children who were already sleepy, tugged along and borne by parents who wanted the experience for them—they would understand one day. There was a Muslim family just a bit ahead of me in the lineup, and a group of young Jewish men sporting yarmulkes a few dozen people behind me. Marines, naval officers, and soldiers were wearing their full dress uniforms. Young couples huddled together in the chilly evening breeze. All were waiting to pay their respects President George H.W. 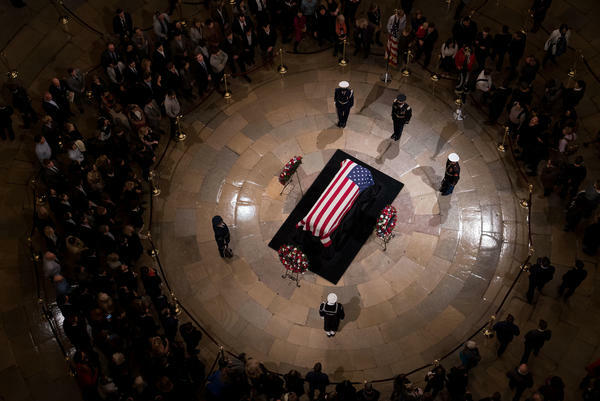 Bush as he lay in state in the Capitol Rotunda. It took several hours to slowly shuffle into the Capitol, where two more lineups awaited: one in the atrium of the Visitor’s Centre, and another just before the escalators leading into the Capitol Rotunda. Finally, we ascended the stairs and entered the silent hall where the late president’s flag-draped coffin rested on the Lincoln catafalque, a wooden platform robed in black that was originally built for Abraham Lincoln’s casket after his assassination in 1865. As people entered the Rotunda, many eyes seemed instinctively drawn upwards to the ceiling of the dome, where one of the strangest scenes in American iconography is painted: The Apotheosis of Washington, which depicts the first president in Heaven among the angels. The sight of President George H.W. Bush’s casket was profoundly moving. One of the last members of the Greatest Generation, he had tried to enlist the day after Pearl Harbor, but was turned back for being too young. He returned to join the US Navy when he turned 18, flew 58 combat missions, was shot down over the Pacific, and had to be rescued by a submarine. Now, the coffin containing his remains was flanked by a stony-faced honor guard made up of representatives of the different branches of the Armed Forces. As a young man, he had fought the Axis Powers. As commander-in-chief nearly fifty years later, he had skillfully handled the implosion of the Evil Empire. Now he is gone, and there are very few like him left. An era is slowly but inexorably passing from memory into history. The arrayed coffin was another sobering reminder, too—a testimony to our collective mortality. Even a man who reaches the pinnacle of earthly power in his lifetime must eventually die and be consigned to the earth. Ashes to ashes, dust to dust. Statues of many great men who departed long ago looked on: Grant, Jefferson, Lincoln, and Hamilton. The Rotunda is a place where the full force of the historical symbolism marshalled on solemn occasions such as these is palpably felt, surrounded as you are by the great paintings of John Trumbull of defining moments in America’s past: the Declaration of Independence, the Embarkation of the Pilgrims, the Surrender of Lord Cornwallis. For a moment, time almost seems suspended as the Past waits to accept another into the pantheon of great Americans who have gone on before. It was silent in the hall as people clumped in front of the casket, some lost in thought, some with heads bowed, some praying. One elderly woman crossed herself, her eyes moist. Several others were in tears, as well. The only sound that interrupted the sober reflections and paying of respects was the click of photographers’ cameras, as photojournalists lurking at the edges attempted to capture the farewells. One elderly fellow nearby had squeezed himself into a campaign sweatshirt from the 1988 presidential campaign. “I’m not quite dead yet,” he told someone proudly as he shuffled out of the Rotunda and down the stairs. One by one, we took our leave. I left the Capitol just after midnight, and still more people were joining the lineups to pay their respects to a president that history has already been kind to. He lived his life with courage, integrity, and decency, and in death, a grateful nation is pausing to remember, reflect, and do him honor. Members of the public view the casket containing former President George H.W. 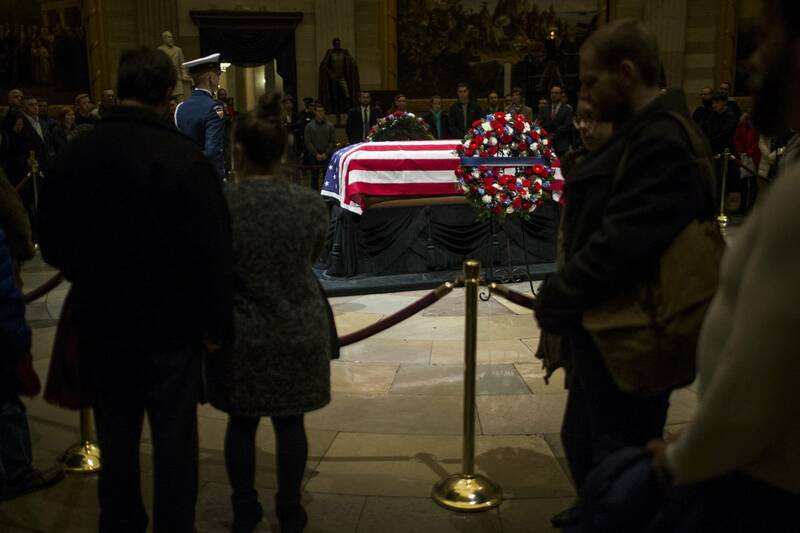 Bush’s remains as he lies in state in the U.S. Capitol Rotunda on Monday night. Well written as always, Jonathon. You make me think, wish I was there. It also made me think about my parents, my father (who was a Dutchman, like yours? ), and my mother, a war bride from Wales, UK. Although my father did not serve in active duty, he still served his country as a Merchant Marine Officer for Royal Shell on an oil tanker for the duration of the war (he was already at sea in 1939), one of the most targeted ships during the war due to its cargo, and he had stories to tell to his children in later years. He also proudly spoke of the letter he received from the then Queen of the Netherlands for his years of service. He was not singled out by Her Majesty, but a letter he had! My mother was a nurse in Swansea; I never heard her tell whether her duties were war related. But they surely had strong feelings of family values, and the sanctity of like: they ended up having 16 children, of which I am the third oldest. I wish I could have done that now! Thank you for this note, Gary! And indeed–my father is Dutch, as well. Three of my grandparents are still living, and all remember WWII vividly. Reading your comment I remember the stories your father told us.